One of the few Americans in Europe in the 1970s, Danny Sullivan finished second to Gunnar Nilsson in British Formula Three in 1975. Following strong performances in Formula Atlantic all around the world, he headed home as his funding ran out and raced in the CanAm sports car series. In 1983 he joined the Tyrrell team for a season in Formula One, largely at the behest of sponsors Benetton who wanted an American driver. He finished second in the non-championship Race of Champions, but fifth place at the Monaco Grand Prix was his only point-scoring return of the season and he was not retained. Returning to the USA he raced Indy Cars and in the following season won the Indianapolis 500 for Penske. 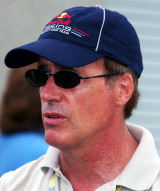 Overall Indy Car champion in 1988, he raced until a year off in 1994. Early in 1995 he crashed heavily in Michigan and announced his retirement. Sullivan was subsequently a major force in the Red Bull Driver Search program.